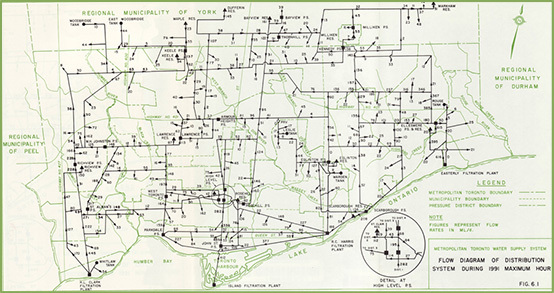 Map showing projected (in 1985) daily maximum flows through the Metro Toronto Water Distribution System. Today, roughly 7-10% ends up leaking out of the system. This is the second in a series of articles discussing pressurized urban utility networks. The first article provided a general discussion of the presence and possibilities of water distribution systems. This article will elaborate further on one neglected aspect of the water distribution networks that underpin our cities: leakage. 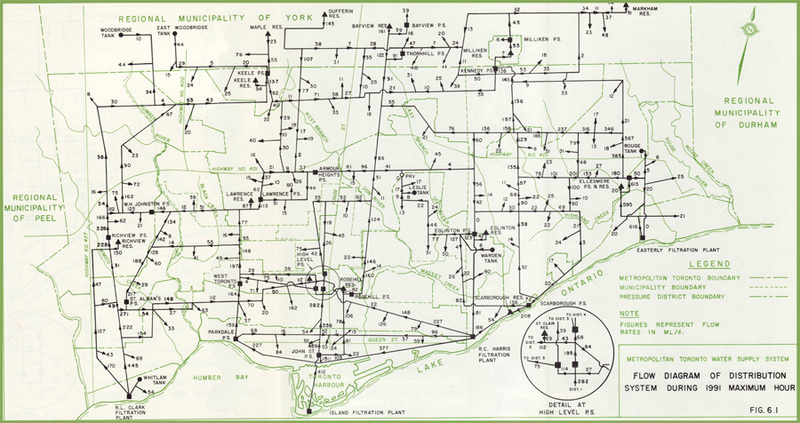 As I have discussed previously, this is a network whose presence beneath our streets sits largely ignored except when laid bare in the disruption caused by planned water main replacement programs or manhole 'breaks', the latter being the sort of catastrophes that produce flooding, ground upheavals, power failures and sinkholes. While flooded intersections and knocked out electrical substations may be the only time that all that pulsing water shows its face at ground level unmediated by taps and sinks, don't be misled. Municipal distribution systems are constantly depositing water into the soil and sub-soil that surrounds them, making an unavoidable and potentially highly significant contribution to the hydrogeology of the city. From "The Water Works System of the City of Chicago," The Chicago Board of Efficiency, 1917. As urban and particularly domestic water use expanded tremendously over the course of the 20th century, and particularly as most cities integrated their domestic water supply and fire-fighting systems into a single network, the pressure of their water systems increased. While one 1908 book about managing public water supplies suggested that residential service required a 'street-level' pressure of 25-35 psi, today's municipal systems maintain pressures of 50-100 psi in order to feed our modern appliances and upper-storey washrooms, and to provide constant pressure sufficient for fighting fires. This pressure also ensures that in normal situations, untreated groundwater cannot infiltrate into the city's water supply — where water finds or creates weaknesses in the pipes and valves of the system, the pressurized drinking water will flow out of the pipe into the surrounding groundwater, rather than vice-versa (similar principles are used to create three isolated water loops within the Enwave district cooling network in Toronto). 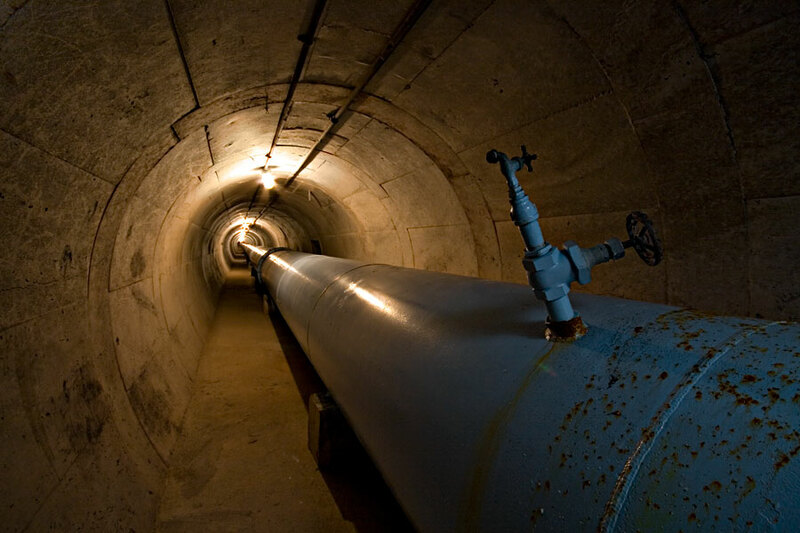 Rather than being a rare occurrence, water is constantly moving from pipe to sub-soil throughout any pressurized underground distribution system. 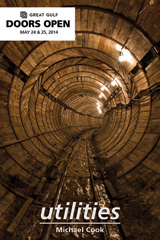 Over the last century or so of municipal water provision in North America, water authorities have periodically waged campaigns against what they viewed as excessive levels of 'wastage' within poorly-built or aging systems. 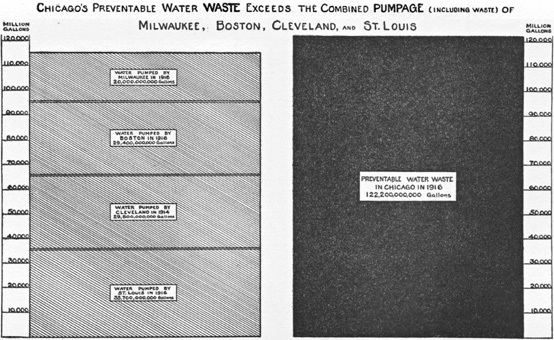 In 1917, for instance, the Chicago Bureau of Public Efficiency published an entire book on the problem of leakage and wastage (as well as other associated concerns) within the Chicago Water Works system, wastage which was then estimated at 60% of the water pumped into the network on a daily basis. And certainly the problem becomes worse when system components reach the end of their service lives — metal and joins rust, perforate or fail, while frost, tree roots, bacteria and stray voltage from neighbouring electrical distribution equipment accelerate the process. Yet even in young and well-maintained systems, leakage is a rule, rather than an exception: the American Water Works Association's standard for daily leakage is an amazing 7,000 L per kilometer of water main. A 2004 audit at Toronto Water estimated distribution losses and other 'non-revenue water' (which also includes unmetered consumption, for instance from users lacking meters or from fire hydrants) at 10% of the water pumped into the system.3 Leakage was estimated to be 103 million litres per day, or approximately 7% of the water pumped into the system. Other estimates peg the Canadian average at anywhere from 10-30%. Despite the appearance that Toronto is doing better than average (although it may be simply that higher rates of per-km leakage may be masked by higher-than-average densities of water use in Canada's largest city), there remains institutional pressure to control leakage. 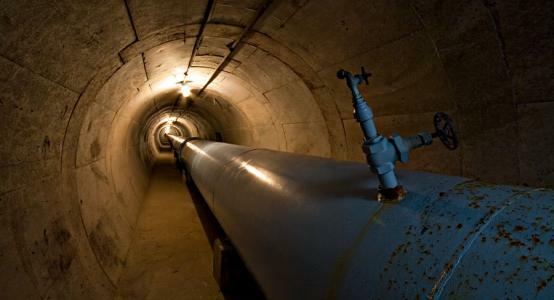 In past years the institutional response would have simply taken the form of an aggressive leak-detection and repair/replacement program, like the long-term programme that the old City of Toronto Works adopted in 1968 and continued into the 1990s. The same 2008 conference paper that many of these current Toronto numbers are coming from provides an assessment of a quite different approach to systemic leakage, taking the form of leak management rather than leak elimination. Accepting that leakage is unavoidable, the study authors tested measures being adopted throughout the industry to manage leaks and prevent them from becoming more serious failures, mostly by moderating local water pressures, especially in low-demand overnight periods. In their study, pressure management cut the calculated leakage from a portion of the system by more than a quarter. However, those savings aside, the practice represents a moderation of the established 'search-and-destroy' approach to leaks. Accepting that leaks are ubiquitous and inevitable not only saves limited capital resources and reduces disruption to life and traffic on the surface, but it also sets the stage for reassessing the position of the water works within the ecology of the city. General discourse about water in the city tends to focus on the impact of hard surfaces like rooftops and pavement, which accelerate runoff from precipitation while preventing infiltration. Urban centres may see as much as 55% runoff with just 15% infiltration, as compared with areas of natural groundcover, where runoff may be as low as 10% and infiltration into the soil as high as 50%. Even suburban areas may see 20-30% runoff and 20-35% infiltration.4 Less well-recognized is the passive contribution that urban water distribution systems may be making to groundwater recharge in urban areas like Toronto (where drinking water is drawn from surface water bodies, rather than groundwater). My back-of-the-envelope math suggests that water leaking from Toronto's distribution system represents 14% of the rainfall the city receives in a typical year, most of which hits impermeable surfaces and ends up as runoff or evaporation. According to local non-profit RiverSides, 70% of Toronto's surface area is impermeable,5 which means that in the built-up areas of the city, water system leakage may occur at a level equivalent or greater than the rate of natural infiltration from precipitation. If this is the case, water leaking from the distribution system represents a crucial (if chlorinated) source of water infiltration, supporting plant and underground ecologies and contributing to deeper groundwater flows. The problems of deposited chlorine notwithstanding, system leakage thus represents a kind of carrying payment on our urban water debts, an offering to the ecologies and hydrologic cycles that we have disrupted with asphalt, sewerage, and bulk water extraction. It cannot possibly solve any of those problems, but is worth noting nonetheless. At the very least, if you see in your neighbourhood a great tree surrounded by parking lots and buildings, its survival may owe as much to your local water service as to deep roots tapping surviving flows of natural groundwater. Many communities in South and Southeast Asia celebrate water festivals, such as Songkran in Thailand, in which participants splash water on each other, passers-by, and their surroundings as a ritual of cleansing, respect and good luck. Perhaps it is time that we recognized the contribution to the urban environment that the inefficiencies of our water distribution systems represent (as opposed to the inefficiences of our active water use, which mostly end up in sewers and drains), and viewed the 'losses' in a similar manner to those water offerings, as a part of the spiritual presence and maintenance of the city and its roots in the landscape.